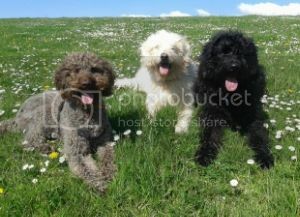 UK Labradoodle Association • View topic - Greedy or hungry? Post subject: Greedy or hungry? How do I know if I am feeding enough. Daisy seems starving when I feed her and whimpers for more. The guidelines on the pack are a wide range and as she is small I go fairly low on the scale. She doesn't look thin and has plenty of energy and plenty comes out the other end. Is there an easy way to know? Post subject: Re: Greedy or hungry? the guidelines are not always right for labradoodles as you wont know their height. On here somewhere there is a chart to help you with it - I will pop back later and try and find it. I think you need to see the dogs waste. Labradors can be hungry all the time whereas poodles are more fussy. NOt sure what cross Daisy is but Lulu turned to being a very fussy eater to a "begger". At first I couldn't train her with treats as she wasn't interested but now she will do anything for a treat. I recently took her to the vet and I said she looked a little skinny to me and the vet said she was just right and must not put any more weight on. I realise this is not too helpful but I think it is more not to drive yourself mad with it. Too much food usually leads to soft or sloppy poo so that is one clue that she is having too much food. If she is growing steadily then that suggests she isn't having too little. It is a matter of balance and will be constantly changing as she grows. As long as she is lively, growing, and not fat you have got it right! If you are really concerned pop her to teh vets for a chat with one of the nurses there. Do your vets run puppy parties? They are good opportunities to discuss your concerns with a nurse and other new owners. She was going frantic barking and scraping at the utility door (where her food is), while I cooked dinner. Her poo is formed but can be a bit soft in the middle when picked up (sorry!). She was 1.2kg when I picked her up last week and will get her checked at the vets on Thursday. She should grow to about 15/16" and is a mini Aussie. The food bag says between 1 and 5kg in weight and 2-6 months she should have 60-80g, so quite vague. She probably has 70/75g but acts starving! And don't forget that she's also getting some of her food as treats, too. (I weigh out Wyre's and then take a little back to put in his treat pot for training...) It's those puppy eyes, they work on you, you know! If she is new pup she should still be getting 4 meals a day. When you go to the vets on Thursday, confirm if her worming routine is correct too. If any consolation, I had a lab pup who, when very young,went mental at the hint of food time. He used to leap up and down off all fours at counter height in anticipation of his meal. Bless him. No its by current weight and age! The food is manufactured by the breeder so specific to Doodles. I might give a bit more tomorrow, she is definitely not overweight. The breeder had her on 3 meals a day. She seemed ok to start with and just last couple of days looking starving. She was wormed and not due yet. I will give a bit more tomorrow and speawto vet on Thursday. What sort of food is it? What makes it a labradoodle specific food? Every dog needs the same range of nutrition per kg of dog. It may be an excellent food but I would view this claim with scepticism as it's a very clever way to make more money! I went with food that does not contain dairy or wheat or any grain at all, as labradoodles do seem very prone to allergies. When Lola was a pup, she is 5 now, there were very few to choose from, Applaws and Orijen. She started ff on Applaws as Orijen was a bit rich for her tum as a pup and is now on two different flavours of orijen morning and evening with Nature's menu meat and veg in different flavours as well. I'm a firm believer in giving them a range of tastes and textures - they are mammals, and the thought of feeding them just kibble of the same flavour forever is awful - food is one of their main delights. So she also gets some chicken or fish mixed in several times a week. Lola is a 6.7kg, 14 inch high, mini Aussie labradoodle. She now eats a rounded quarter cup of Orijen kibble and about an inch and a half piece from each Nature's Menu sachet morning and evening. I go by her spine, it should not be too prominent, but you should be able to feel it. Rub you fingers over her ribs - it should feel the same as rubbing your fingers over your flat hand's knuckles. If it feels the same as your hand's knuckles in a fist, you are not feeding enough. You may be feeding enough, but remember if she has been doing a lot of exercise on one day, or not had as many treats, she may feel hungry. You should give a little more accordingly. Remember too, that as she grows she needs more food so you need to keep increasing it. I do wish there was a 'like' or 'agree' button! I'd also mention perhaps looking at raw feeding - Ianto had a raw chicken neck this morning and loved it!